The Products plugin is used mainly to showcase certain vehicle models within your WordPress website. 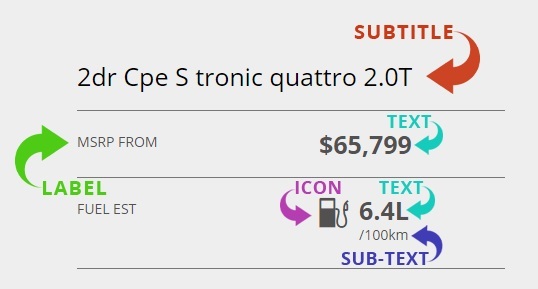 A Product page will contain certain vehicle properties, a vehicle image, various CTAs, a write-up on the vehicle, a contact form, and an inventory feed. 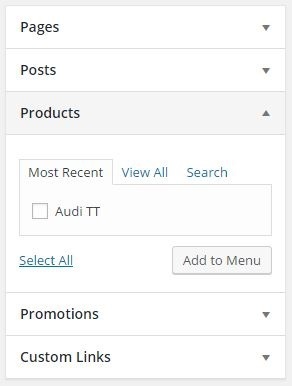 If you have this link in your wordpress admin menu then you have the products plugin activated. Click the “Add New” Link under the Product Menu. Product properties include these editable areas: Subtitle & Repeatable Detail Fields. The Repeatable details fields are made up of 4 sub fields; Label, Text, Sub-text & Icon. See Below for an example. You can add as many repeatable detail fields as you would like (we recommend 4 – 5). Pick between linking out to local WordPress Pages or external links (Such as Inventory or Build and Price Pages). You can add as many repeatable Link fields as you would like (we recommend 4). Lastly you can select the number of vehicles to display from that feed. When your product page is complete, just go to Appearance > Menus. On the left where it lists, Pages, Posts, Products, ect. Click the Products tab and all your product pages will be displayed, then continue to add as if you were adding a regular page (Drag the link in the Menu under an inventory Menu item).